Kit preview of BanDai's Cowboy Bebop Swordfish II . Cowboy Bebop is yet another anime set in a future (A.D. 2071), where earth's population has spread out into space. It's the story of the adventures of the spaceship Bebop and its crew of bounty hunters ("Cowboys", in the slang of the future): Spike Spiegel, Jet Black, Faye "Untouchable Shrew Woman" Valentine, Ed the hacker and Ein, the super- intelligent dog. ^ Instructions are logical and easy enough to follow. Each of the three main characters has a fast, heavily armed personal ship in which they track down their bounties. 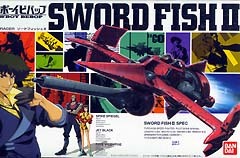 Spike's is the Swordfish II .... one of the oddest designs I've seen on screen. BanDai's is the first injected kit of any of the ships (the Swordfish and Faye's Redtail were released in resin by Club M) - and so far, the only one. Oddly enough for a kit released in 2000, it's no longer in production, and I had to look far and wide to find one (thanks Ledon!). 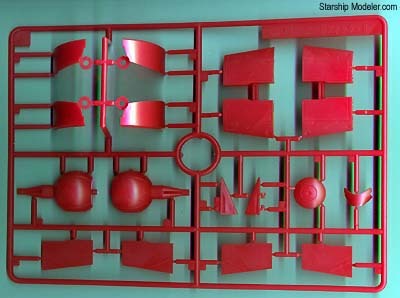 Inside the colorful box is a typical BanDai kit - impeccibly molded, simple to assemble and fairly well detailed. 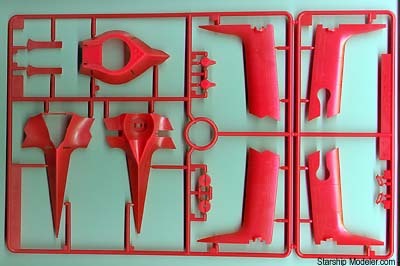 There are two sprues of red plastic parts, one of black and another of clear, two trees with figures and two of polycaps and assorted joints. Detail is rather simplistic, but matches what's seen on screen (it is a cartoon ship, after all). There are no ejector pin marks or sinkholes any place where they'll be visible on the completed model, no flash and minimal mold seams to clean up. The kit features folding wings, removable cockpit pod, and external ordnance (though the ship is usually seen sporting just the hugely phallic plasma gun and a pair of machine guns). 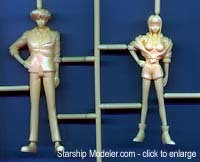 Three large figures (alledgedly 1/24 scale) are provided, one each of Spike, Faye and Jet. Two smaller (1/72?) figures of Spike are also provided, one standing and the other flying the ship. These are in the PVC BanDai uses for all figures in their kits, which means it's soft, pliable and .... hard to paint. 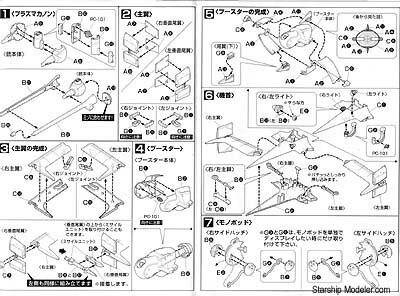 Instructions are the typical exploded diagrams, broken into 9 assembly steps. All text is in Japanese, but that should not be a problem. If you've built a model or two before, the diagrams are self-explanatory. Also included is a color section with character bios and history, also mostly in Japanese. 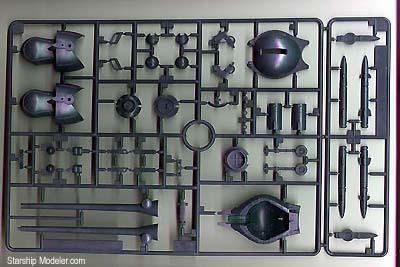 The paint/marking guide consists of several pictures of the completed model and the figures, plus six paint chips, with Japanese text explaining the ratio at which to mix standard colors. For those of us that don't read Japanese, the pictures and the boxtop appear to be enough reference material. No decals or other transfers are provided, which is fine, as this ship carries no markings. This kit appears as easy to build as any of the BanDai robots.Though a snap-together, I've found it better to glue all the styrene pieces together - makes it easier to remove seams, if nothing else. The only "gotcha" I see is the canopy is molded in clear, and all pictures I've seen show this as gold tinted. Time for to crack a bottle of Gunze clear orange and another of clear yellow, I think. The boxtop and all the images I've seen from the show indicate a somewhat battered and weathered vehicle, though the instructions do not. Interestingly, scratches and dings appear to be black or dark grey, not silver/aluminum - something to keep in mind. I like it. It's bizarre. It's also something I could have built relatively quickly, allowing me to spend more energy on painting and weathering. Unless you've never built a kit before, you should have no problems banging this one together, though kids will probably need some help, due to the lack of English instructions. Highly recommended. Many thanks to my wallet for providing the review sample - and my accountant (wife) for authorizing the expenditure. Manufacturers and retailers, interested in getting your wares reviewed and publicized on a site averaging 2000+ readers a day? Contact us! This page copyright © 2001 Starship Modeler. Last updated on 16 January 2001.